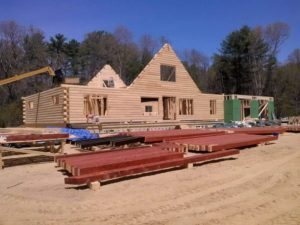 Jarlogs is a family owned and operated general contractor specializing in building Cedar log homes, proudly serving the New England area for the past 43 years. The company was founded by John A. Ross in 1973, Steve Ross became the president in 1984 and with the help of his sons Jon and Dan, has run the business since. We offer expert log home consultation services, which includes the selection of your building site, blueprint review, material selection and estimation of total cost. John A. Ross and Son Inc. is an authorized representative of Moosehead Cedar Log Homes of Maine. We can build your log home from start to finish as the general contractor (license #031781) or build you a weather tight shell (a locked up, dry building ready for sub-contractors and finish work). 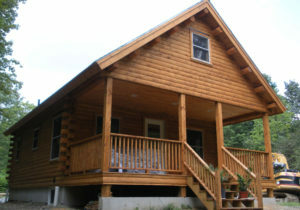 We are experts at repairing, restoring and maintaining log cabins. We can do corn-cob blasting, caulking, staining and any other upgrade that may be needed. We also perform specialty detail log work including log railings and log furniture. John A. Ross & Son, Inc..
John A. Ross & Son, Inc.